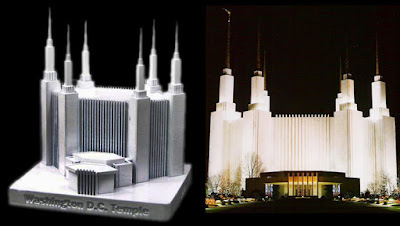 The Washington DC Temple of The Church of Jesus Christ of Latter-day Saints is a well-known landmark of commuters along the Capital Beltway. Driving near Kensington, Maryland just outside of D.C., one can’t miss the gleaming white building and gold spires. Completed in 1974, the building stands 288 feet tall with six-spires and the three towers. InfocusTech made a pewter replica of the temple that stands 4.25 inches tall and is finished in white. The real building is made of reinforced concrete sheathed in 173,000 square feet of Alabama white marble.